If you can’t stand the suspense of waiting til just a few days before to book a cruise, you can also get some unbelievable deals on last minute cruises. 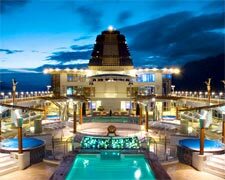 In the days before a sailing, cruise lines will often offer up the remaining spots on the ship for amazingly low prices to get a few more people on board. This means with a little spontaneity, you could potentially save hundreds of dollars. If waiting til the last minute isn’t so much your thing, you can still get a good price on most of the cruise lines this time of year. With summer and fall marking the low season for many cruise operators, like Carnival Cruises, there are many discounted cruises out there.